One of the biggest fears landlords have is to get that late night call from their tenant saying they have no heat, or a frozen pipe just burst. A sure way to avoid these stressful situations is to hire a property manger, which has answering service 24/7, follows a preventative maintenance schedule and has contractors on stand by if needed. Evolve Real Estate and Property Management provides all this and much more for the Denver area landlords. We will take the worrying out of owning rental properties. Tree and bush trimming in the fall is essential. With our unpredictable Colorado weather and spring blizzards, snow and ice can weigh down the trees and shrubs and they can get easily snap, potentially causing more damage. Clean out the gutters. You don’t want melting snow to spill over the gutter on your sidewalk and become a liability. Furthermore, clogged gutters can cause roof damage. Blowout the sprinklers. Most leases state that the tenants are responsible for yard work. However, we don’t recommend that this task be left up to the tenants. Not all are knowledgeable or responsible enough to complete this task properly. If the sprinklers are not properly blown out and the valves drained – they can freeze and cause thousands worth of damage. All while you could have paid someone under $50 to blow them out professionally. Winterize your swamp cooler and protect the A/C unit. Winterizing your swamp cooler can too save you from the hassle of dealing with frozen pipes. Cover up your A/C unit. Protect any uninsulated pipes by wrapping them up in foam sleeves, detach garden hoses from spigot and drain those lines. Have the furnace serviced. This can save you hundreds if not thousands. Those no heat calls in 30-degree weather really do add up. Get an early start and ensure you won’t be getting any “no heat calls”. Check smoke and carbon monoxide alarms. Carbon monoxide detectors are especially important in the cooler months since most people keep their windows closed. Order a chimney sweep. If you rental has a fireplace, chances are the tenants would want to use it with the colder temperatures. Make sure it is not a fire hazard. Clean out ducts. Every few years you would want to do this, as it prolongs the life of your heating system. Inspect doors and windows: is the weather stripping intact? Are windows leaking any air? 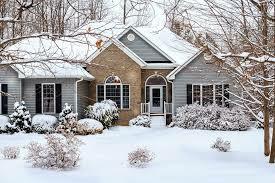 Being prepared for winter can save you stress, money and time.